The holidays are a time for gift-giving and celebration with family and friends. We look forward to delicious desserts each year and love baking cookies and cakes as homemade gifts for family and friends. Unfortunately, with as hectic as the season has been for us, finding the time to bake can be a challenge. Luckily, we've come across Dancing Deer Baking Company! Their baked goods are deliciously decadent and taste just as fresh as if we had pulled them out of the oven ourselves. And to be honest, they taste a whole lot better than anything we've ever made in our own oven. The Dancing Deer Baking Company collections are a fantastic time saver for busy households. The pricing is affordable and they offer a range of choices to fit most anyone's budget. The festive red packaging adds a special touch that makes for an upscale presentation. We chose the Classic Brownie and Cookie Gift to take as a hostess gift for our first holiday party of the month. She loved the festive presentation and put the brownies and cookies out for guests right away. It's no surprise that they were a hit —particularly the Caramel Sea Salt Squares! 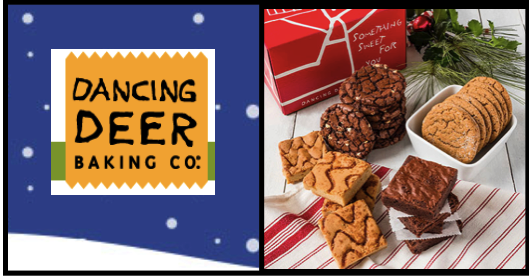 So many people asked us where we ordered from that we fully expect Dancing Deer Baking Company treats to be showing up at a lot of holiday parties this year! The collections offered on the Dancing Deer Baking Company site are perfect gift ideas for friends, family, coworkers, employees or clients. 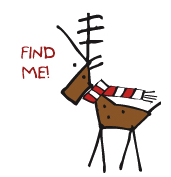 Dancing Deer Baking Company is running a festive and fun 'Deer on the Shelf' game that we wanted to share with all of our readers. Head to their site between now and December 18th to enter for your chance to win their daily prize! Read the game rules here. Check out the Dancing Deer Baking Company site to peruse their wide assortment of gifts for all occasions, delivered directly to your door. Be sure to check out their homepage to take advantage of any special holiday deals. Connect with Dancing Deer Baking Co.
Disclaimer: The product in this post was provided by Dancing Deer Baking Company. As always, our posts are our own opinions and may differ from yours.